You know the feeling when an airline upgrades your seat from coach to first class, or a hotel upgrades your standard room to a suite with a view? Well that’s about to happen with your Docket Navigator subscription. 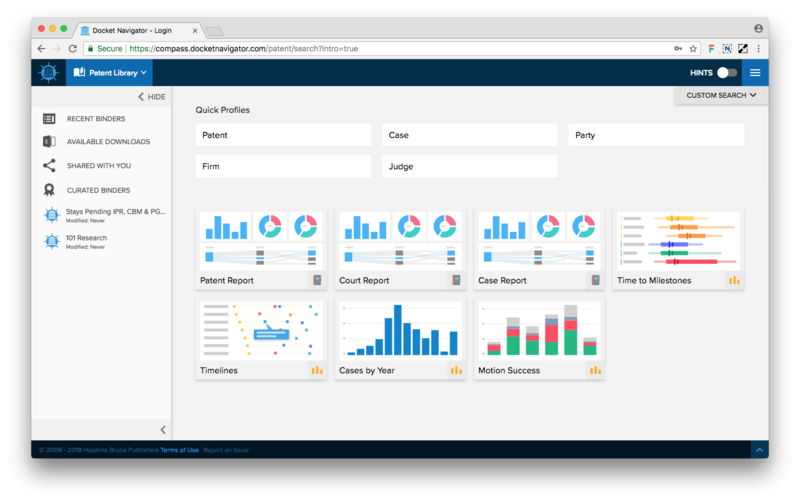 We’ve built an entirely new user experience that makes accessing litigation data and analytics faster and easier than ever. It’s called Compass and you’re going to love it. Compass is our new research platform with an updated look and mobile-friendly user interface. It is powered by the same data as the current platform (the Legacy system) and supports the same searches and features. But Compass adds many enhanced features like pre-configured Reports and Quick Profiles you can access in seconds, more powerful search filters for precision research, bulk export download and print options, collaborative tools, and re-engineered bundled alerts to reduce email clutter. When will Compass be available? Compass is available now! You can log in and give it a try anytime. Will Compass change the Docket Report email or my Alert emails? Yes and no. The look of your emails will change. Compass sends redesigned emails that are easier to view on mobile devices, but also look great on any device. The information in the emails will not change. The most important difference is that our old-format emails link to the Legacy system and the new-format emails link to Compass. Whether through Legacy or Compass, all email links access the same great Docket Navigator data. 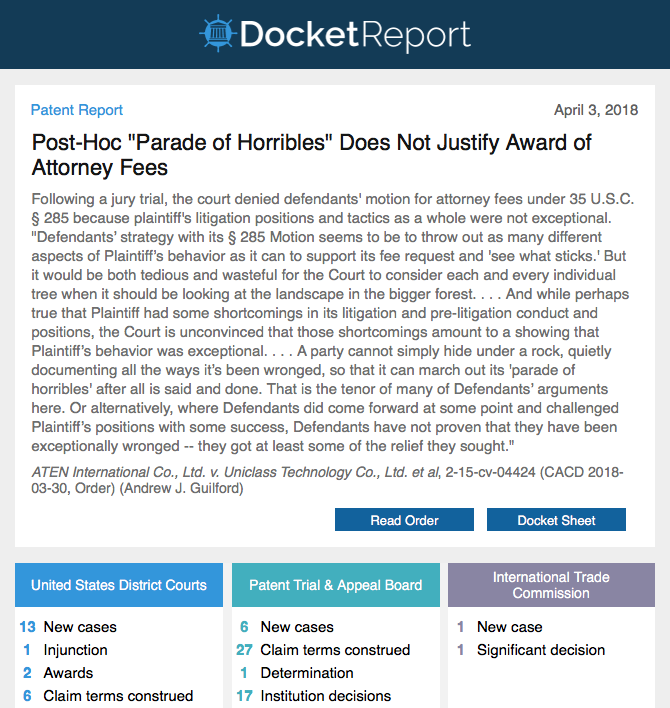 How do I convert to the new Docket Report email format? It’s easy. Just click the button to get started. If I convert to the new Docket Report format, can I change back? Yes, just send an email to contact@docketnavigator.com and we’ll switch you back to the Legacy version until you’re ready to try again. Can I move my existing Alerts to Compass? Just select the Alert on your Alerts page and click the “Create Alert in Compass” button at the top of the page. Ctrl+click to select multiple alerts to convert at once. Do you offer resources to learn more about Compass? Yes, you can watch a short introduction video at the top of the page. You can also visit the Compass Training Center for video tutorials and webinar schedules. For text instructions, definitions, and details on the scope of our data, check out the Compass User Guide . We’ll also send email announcements as new features are released. How long will the Legacy system be supported? We know change can be disruptive, even positive change. So, we’re keeping the Legacy system online through the end of 2018. That way you can get to know Compass and its new features at your own pace. Throughout 2018, you have a choice to use the Legacy system (including Legacy Alerts and the Legacy Docket Report), or Compass (including Compass Alerts and the Compass Docket Report). In 2019, we’ll begin the process of decommissioning the Legacy system. At that time, the Legacy system will become inaccessible. Any remaining Legacy Alerts will be automatically converted to Compass Alerts, and the Compass Docket Report will become the only delivery option. Will converting to Compass incur any additional charges? No. You can conduct searches in Compass, convert Legacy Alerts to Compass Alerts, create new Compass Alerts, and select the new Compass Docket Report all within the scope of your existing subscription without incurring additional charges. What is a “Plus” subscription? In 2019, we will begin offering two types of subscriptions: Essentials and Plus. Essentials includes the core features previously available in Legacy: daily delivery of the Docket Report, unlimited searching of the Legacy system, unlimited custom Alerts, and optional delivery of New Case Alerts. Plus subscriptions include all of the Essentials features, plus new features like Analytics and Reports. Click here for a complete list of features in each subscription type. During 2018, Essentials subscriptions will include all Plus features. The selected subscription type will apply to all users in an organization.